There is a long-standing charge that the Republican Party’s electoral success in the South is due to racism. When the charge was levied 11 years ago by Paul Krugman, I addressed it here. Though my response was correct in the main, I would change some of it. It should be obvious from [Lincoln’s own statements] that Lincoln’s basic ideology that people have a right to the fruits of their labor, and that government, if it gets involved at all, should merely provide idlers and indigents with the means to become self-supporting, is even today the basic ideology of Republicans. And it is equally clear that the confiscatory principle “You work, I eat” is even today the basic ideology of Democrats. The entire welfare state, from the New Deal through the Great Society to contemporary Democratic schemes, are all rooted in the same plantation philosophy of legally-sanctioned theft that Lincoln identified more than a century and a half ago. [A] majority of blacks became Democrats in the 1930s. This was at a time when the Democratic Party was manifestly the party of segregation and the Ku Klux Klan. FDR, who got less than one-third of the black vote in 1932, got 75 percent of the black vote in 1936. Why would blacks leave the party of emancipation and resistance to segregation and lynching and join the party of bigotry and white supremacy? The depressing answer is that blacks did it in exchange for the crumbs that they got from FDR’s New Deal. We have seen earlier how FDR designed the New Deal to exclude African-Americans and preserve Jim Crow. How delighted and amused FDR must have been to see blacks coming over to his camp even as his administration worked closely with racist Democrats to screw them over….. Since LBJ, blacks have voted for Democrats in the 90 percent range. This second generation of blacks in overwhelming numbers gave their electoral consent to becoming part of LBJ’s Democratic plantation…. [T]he timing and motivation of the black switch is a decisive refutation of the progressive lie that blacks wisely left the Republican Party because they recognized it as the party of white supremacy, and joined the Democratic Party because they knew it had become the party of civil rights. That wasn’t the perception; neither was it the reality. Nixon lost [Arkansas, Louisiana, Mississippi, Alabama, and Georgia in 1968]. Goldwater won [four of those] states [plus South Carolina] in 1964, the only states he carried other than his native Arizona. Not that Goldwater was a racist—he was a founding member of the Arizona NAACP and had pushed to integrate the Arizona National Guard and the Phoenix public schools. He had supported the Civil Rights Act of 1957 which established a Civil Rights Division in the Justice Department, as well as another civil rights bill in 1960. These sensitivities on the part of blacks were, of course, understandable. Unfortunately for the GOP they cost the party dearly. Previously, Martin Luther King, Jr., had maintained his independence from both parties; now he joined the Democratic camp. And Goldwater paid not only with a disastrous election loss but also with the loss of his reputation: the characterization of Goldwater as a racist, although false, has endured as a staple among today’s progressives…. [Kevin] Phillips argued [in The Emerging Republican Majority] that Nixon understood that he could never win a majority by appealing to the Deep South. He had just seen Goldwater win the Deep South and lose the rest of the country in considerable part because of his position on the Civil Rights Act…. What Nixon did, according to Phillips, is appeal to the Sun Belt, “a new conservative entity stretching from Florida across Texas to California.” The Sun Belt reflected a modernizing economy grounded in defense, manufacturing, technology, and services and was—and still is—the fastest growing part of the country. Phillips argued that whoever wins the Sun Belt wins the presidency…. In the South itself, Nixon targeted the urban population of the Outer or Peripheral South. Nixon was not after the Deep South states of Mississippi, Georgia, South Carolina or Alabama; he barely campaigned in those states. Rather, he was after the Peripheral South states of Florida, Texas, Arkansas, North Carolina, Tennessee and Virginia…. And within these states, Nixon’s campaign focused on cities: Tampa, Atlanta, Dallas, Little Rock, Norfolk, Raleigh, Nashville. … Nixon appealed to these Peripheral South voters not on the basis of race but rather on the basis of Republican policies of entrepreneurial capitalism and economic success. In other words, he went after the Peripheral South’s nonracist, upwardly mobile voters, leaving the Deep South racists to the Democratic Party. And sure enough, in 1968 Nixon won Virginia, Tennessee, and Florida in the Peripheral South and the entire Deep South went to the racist Dixiecrat George Wallace. … This question is taken up in political scientists Byron Shafer and Richard Johnston’s important study, The End of Southern Exceptionalism…. … Shafer and Johnston show, first, that the South began its political shift in the Eisenhower era. Eisenhower, who won five Peripheral South states in 1956, was the first Republican to break the lock that the FDR Democrats had established in the South. Obviously, this early shift preceded the civil rights movement and cannot be attributed to it…. [T]he increasingly industrial “new South” was very receptive to the free market philosophy of the Republican Party. Thus Shafer and Johnston introduce class as a rival explanation to race for why the South became Republican. In the 1960s, however, they cannot ignore the race factor. Shafer and Johnson’s ingenuity is to find a way to test the two explanations—race and class—against each other, in order to figure out which one is more important. But, in fact, Shafer and Johnson find, through a detailed examination of the demographic data, this is not the case. The wealthier, more industrial, more integrated New South moves first into the Republican Party. This happens in the 1950s and 1960s. By contrast, the rural, agricultural, racially homogeneous Old South resists this movement. As far as congressional House and Senate seats are concerned, the South didn’t become solidly Republican until 1994. Again, this was due to the Newt Gingrich agenda that closely mirrored the Reagan agenda…. … The South has now become like the rest of the country. Southerners are Republican for the same reason that other Americans are Republican. And black Southerners vote Democratic for the same reason that blacks everywhere else vote Democratic. For whites no less than blacks, economic issues are predominant, foreign policy and social issues count too, and race has relatively little to do with it. Drawing on Dave Leip’s Atlas of U.S. Presidential Elections, I recorded the percentages of the presidential popular vote cast for Republican candidates, by State, for every presidential election since the Civil War. I sorted the States into two groups: (a) the 11 States of the Confederacy, and (b) all the others. I derived, for the two groups and each election year, the mean and median values of the GOP candidates’ percentages of the popular vote. I then computed, for each election year, ratios of the means and medians for the Confederate States to the the means and medians for the other States. The proximity of the means and medians attests to their validity as measures of the Confederacy’s political alignment with the rest of the nation. Values below 100 percent mean that the States of the Confederacy were less prone than other States to vote for GOP candidates. 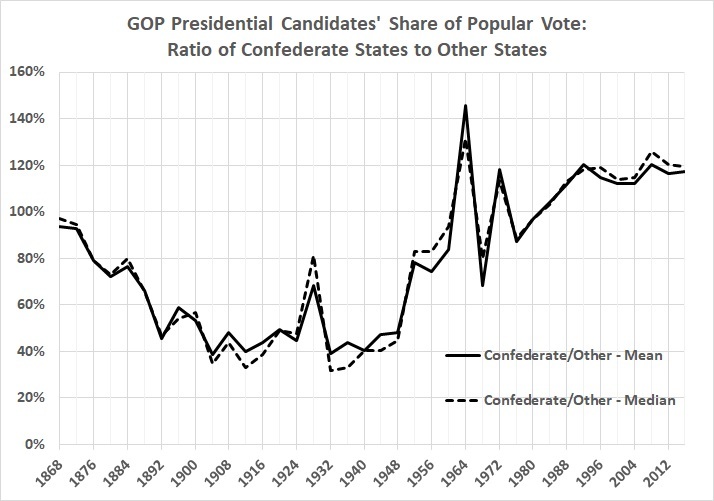 Values above 100 percent mean that the States of the Confederacy were more prone than other States to vote for GOP candidates. There was something like parity in only five elections: 1868, 1872, 1960, 1980, and 1984. D’Souza’s explanation for what happened after that is compelling and needs no elaboration. The South has become the North in reverse, growing strongly Republican (as the North has become strongly Democrat) for reasons of political ideology, not of race. The real complaint of Krugman and other “progressives” is that Republicans have been winning elections far too often to suit them. They have a case of Republican Derangement Syndrome which is so severe that they can only attribute the GOP’s success to racism. That is because they are unwilling to attribute it to the inferiority of the “progressive” agenda. The charge of racism is misdirected by 180 degrees. Racist “progressives” — theirs is the bigotry of low expectations — are conjoining psychological projection and an outdated stereotype of Southerners to paint Southern Republicans as knuckle-dragging racists.